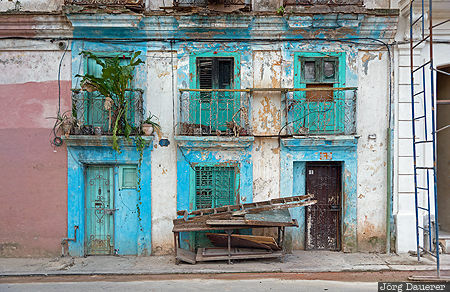 A typical colorful decaying facade in Habana Vieja (Old Havana) with doors, windows and balconies. Havana (or La Habana) is the capital of Cuba. This photo was taken in the morning of a sunny day in February of 2016. This photo was taken with a digital camera.